Sonic Rendezvous B2B site Retail prices available after log in. One of the most rare and unknown Italian Minimal Synth bands from the 80's. Musumeci were formed in Turin at the beginning of 1985, from an idea of Mauro M. (synthesizers - ex guitar player of Rude Pravo) and Franco G.(programming - ex noise maker of Errata-S-Corrige).The group was founded as a link and expression of various experiences, aimed, at least initially, to highlight the individual personalities of the members. The formation settles after six months of testing with the final entry of Laura G. (ex-keyboardist of Rude Pravo) and Paul C. (voice of K Position). Musumeci were playing several shows, preceded by long monologues in which find space rumorism, electrical scans, voices, screams, etc. 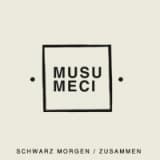 Presented here are the two super rare demo tapes that Musumeci recorded in 1985 ("Schwarz Morgen") and in 1986 ("Zusammen"), on their own label Zeltweg.